An array is a collection of similar data types. It contains the values of homogenous or similar type. It is also known as static data structure because size of an array must be specified at the time of its declaration. It can contain values of either primitive or reference type. It gets memory in heap area. Index of array starts from 0 to array_size – 1. In the above diagram, we are representing one array with its indices. Its size is 10 and hence last index of this array is 10 -1 (size -1) = 9 and element is 100 at the last index. What are the features of Array? It’s a collection of similar data types and hence we can store only similar type of elements. We can store only fixed set of elements as its size is static and it will not grow dynamically. We can easily perform sort and search on the Array. int[ ][ ] arr; // two dimensional array. int[ ][ ] arr;   // two dimensional array. 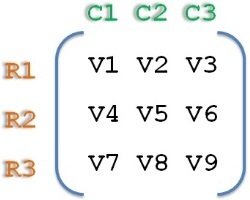 The above line creates an empty array named “marks” of integer type whose size is 5. The above line creates an empty array named “alphabets” of character type whose size is 26. We can access the element in the array using its index. We can access 5th element using arrayName. marks gives 90, marks gives 80 and marks gives 100. Where ‘length’ is the variable name. So far, we have seen single dimensional arrays where it will have single row and multiple columns. Each element is present in one column in a single row and hence its single dimensional array. In case of multidimensional array,elements are arranged in multiple rows and multiple columns. So, accessing element at 2nd row and 3rd column is Matrix and which is “6”. Element at 3rd row and 2nd column is Matrix which is “8”. 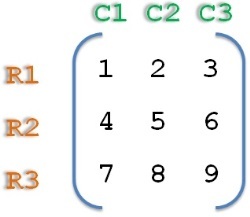 Which is Matrix[3-1][3-1] = matrix and which is “9”.